On December 12th, 2015, at the United Nations Conference on Climate Change held in Paris, 195 countries adopted the first-ever universal and legally binding climate deal. They agreed to decarbonize the economy in order to hold the increase in the global average temperature to well below 2ºC relative to the preindustrial levels. Although each country is free to design its own strategy on mitigation and adaptation, it will be bound to such strategy and is supposed to implement the bulk of the adjustments by 2050. Many questions arise from the Paris Agreement that points to a second Industrial Revolution. What are the required changes in the structure of production and in the patterns of consumption? What will be their impacts on emissions, employment and international trade? This book answers these questions from a variety of input-output models able to compute the impacts on specific sectors and regions. This volume has 17 chapters written by 52 co-authors who are specialists in input-output analysis and environmental sustainability. They come from 24 universities, research centers and international agencies all over the world, sharing their commitments to explain important and complex ideas in a way that is understandable to the non-experts and experts alike. 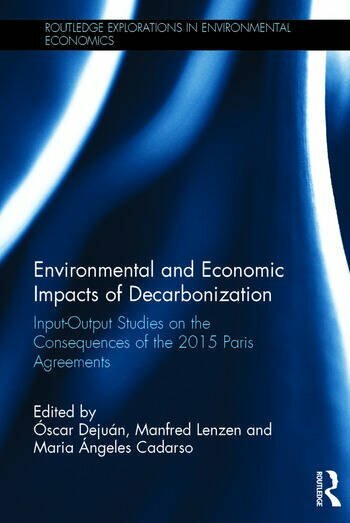 Environmental and Economic Impacts of Decarbonization is a very important read for those who study environmental economics, climate change and ecological economics. Global income inequality and carbon footprints: can we have the cake and eat it too? Óscar Dejuán is Professor of Economics at University of Castilla, La Mancha, Spain. Manfred Lenzen is Professor of Sustainability Research in the School of Physics at University of Sydney, Australia. María Ángeles Cadarso is Associate Professor of Economics at University of Castilla, La Mancha, Spain.